Julian Castro joined a bevy of other 2020 Democrats on Wednesday by calling for the abolition of the electoral college. 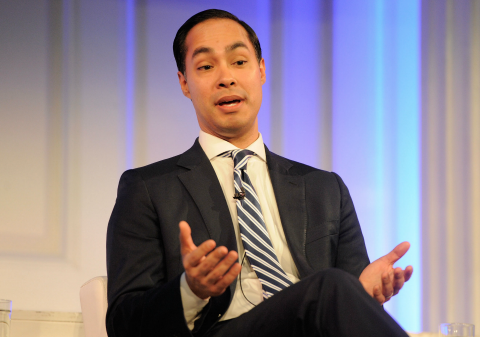 Castro, who previously served as mayor of San Antonio and secretary of housing and urban development in the Obama administration, told BuzzFeed News he supported efforts to "do away with" the institution. The admission makes Castro the latest candidate vying for the Democratic presidential nomination to endorse eliminating the electoral college. Such an idea has been increasingly discussed in liberal circles since the 2016 election. In that race, Hillary Clinton lost the presidency to Donald Trump, despite winning the popular vote. Although similar circumstances occurred in three prior presidential elections, most infamously the 2000 race, liberals argued Trump's victory was "illegitimate." Such criticisms have continued even though opponents have argued Clinton's large margins in "blue states," like California and New York, were the basis for her popular vote victory. Sen. Elizabeth Warren (Mass.) was the first Democrat running for president to champion the idea of eliminating the electoral college. "My view is that every vote matters, and the way we can make that happen is that we can have national voting, and that means get rid of the Electoral College," Warren said during a CNN town hall in Mississippi earlier this month. Warren's competitors for the Democratic nomination were quick to echo her call, albeit with different reasons. On Tuesday, former Texas congressman Beto O'Rourke endorsed abolition because it was the only way to encourage more Americans to vote. Washington governor Jay Inslee, who blasted the electoral college as "an archaic" relic of a "bygone age," said elimination was vital to addressing climate change. Not all the 2020 Democratic candidates, however, are on board. Andrew Yang, an entrepreneur running for president on a platform emphasizing a universal basic income, among other proposals, was one of the first to voice his opposition. "The problem with deciding Presidential elections via popular vote is that candidates would naturally campaign in urban areas with big media markets and their policies would follow suit," Yang wrote on social media. "Better to have proportional electoral college votes in each state so you campaign everywhere." This entry was posted in Politics and tagged 2020 Election, Democratic Party, Elizabeth Warren, Julian Castro. Bookmark the permalink.